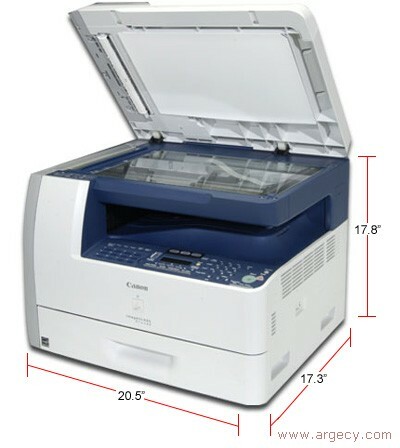 Your copies and prints will be made at up to 24 pages-per-minute for high-quality letter-size documents. 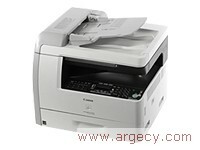 Print resolution is at a crisp 1200 x 600 dpi quality, and comes equipped with 2-sided output capability. Paper handling for the MF6590 can come from either the 500-sheet front-loading paper cassette or the 100-sheet multipurpose tray. Use the multipurpose tray to accommodate a variety of sizes and types of paper stock such as bond, plain and color paper, transparencies, labels and envelopes for special projects. Stack letter or legal-size paper on both the cassette and multipurpose tray for a total capacity of 600 sheets. When copying, use the legal-size platen glass for single-page originals or large, bulky items such as books or newspapers. For multi-page originals, use the 50-sheet Duplex Automatic Document Feeder (DADF). Have you ever needed to copy or fax a document with information on both sides of the page? With the MF6590, now you can. Not only does it allow you to copy from both sides of the original, it also allows you to fax and scan a two-sided original without flipping the page. Fax and receive documents with speed and ease. Documents will transmit quickly with Super G3 (33.6 Kbps) modem speed, which keeps phone line costs down and less wait time for the next job. With a host of convenient fax features like 23 Speed Dials, 100 Coded Dials, and a generous 1000 pages of incoming reception memory, faxing will be simple and effortless. Archive business documents to your PC with color scanning up to an enhanced resolution of 9600 dpi. Reach new levels of productivity with the included ScanSoft OmniPage SE (OCR) software for Windows, a powerful document conversion application. Increase productivity and cost-efficiency with the built-in Ethernet port for networking. Share printing directly from a PC. Built for reliability and ease-of-use, the imageCLASS MF6590 incorporates Canon's Single Cartridge System, as well as years of fine-tuned copying and printing know-how, attesting to Canon's commitment in providing products with a level of quality and expertise that ensures your business runs efficiently and effectively.